Most apps take aim at some small slice of your life and help improve it. 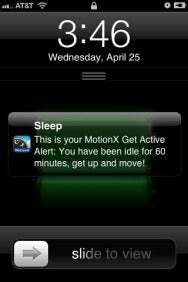 MotionX Sleep is more like the rock band The Kinks—it wants to be with you all day, and all of the night. Dreamtime Data: MotionX Sleep registers when you experienced light, moderate, and heavy sleep, depicted in an easy-to-intepret chart format. As the name suggests, MotionX Sleep intends to make sure you’re getting a good night’s sleep. Activate the app’s sleep-monitoring mode, place your iPhone on the bed next to you—or strap it to an athletic armband—and the phone’s motion sensors will monitor your movements while you rest. Be careful if you’re sharing a bed: The app can capture the movements of both you and your partner, and that makes for less-than-helpful data. 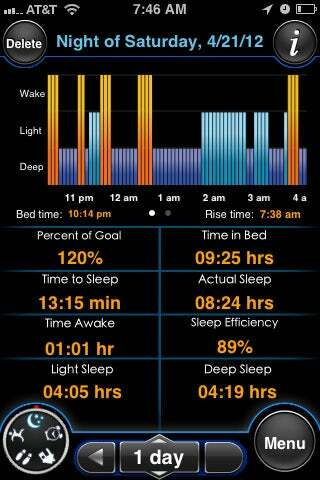 When you wake, MotionX’s app provides analytics showing when you experienced light, moderate, and heavy sleep. (It also offers a “sleep efficiency” number.) Those charts, which track data for as long as a month, can be shared with your friends via Facebook or Twitter. Those analytics can help you make smarter daytime choices. After one night of tossing and turning—marked as an extended series of bright orange lines in the chart—my wife pointed out I’d had a mid-afternoon coffee the day before. So no more afternoon caffeine for me. MotionX Sleep also comes with an unusual alarm clock. You can set the alarm for, say, 7 a.m.—but if the monitor determines you’ve entered light sleep during the hour before that, it will wake you up at that “optimal” time. Often, in my case, that meant waking up the full hour before the alarm, but I did feel relatively refreshed. Keep On Moving: In addition to monitoring sleep habits, MotionX Sleep can double as an electronic pedometer and it can warn you if you’ve been sitting around for too long. 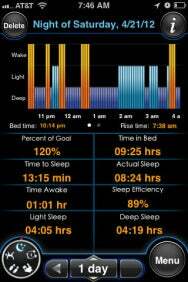 The app doesn’t confine itself to your sleeping hours. It can also monitor your daytime activity, acting as an electronic pedometer that counts your steps while you walk. A related function also sounds an alarm if you’ve been sitting at your desk without moving for an hour. (You can adjust the time increments.) That alarm doesn’t always seem to work properly—MotionX Sleep reminded me to move just after I’d been up and around doing errands in my house. If you want slightly more active encouragement, MotionX Sleep includes a voice coach to guide you on recorded walks, measuring the distance you march while updating you—through your earbuds—on the elapsed time and estimated calories. Some drawbacks: A round-the-clock app can obviously put a strain on your iPhone’s battery life. The developers suggest plugging in the phone during sleep hours, but that’s not always a satisfactory solution if you’re monitoring your rest. More likely, you’ll have to choose whether you want the app to monitor your sleep or monitor your daily movements: It will be hard to capture both accurately. 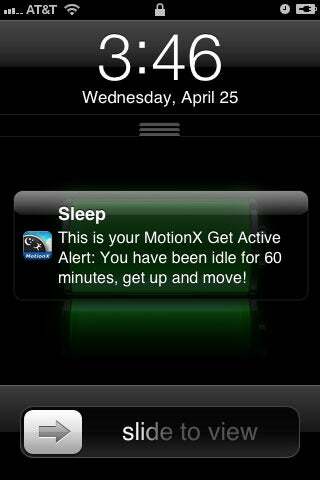 But MotionX Sleep really does do what it promises: It can help you move more and sleep better. There aren’t too many apps that can be truly called “refreshing,” but this one fits the description.